Show that you support someone who is battling Multiple Sclerosis when you attach this eye catching MS Awareness Key Chain to your keys. No matter who you’re supporting, everywhere you go you’ll always be helping to raise awareness. Great as Multiple Sclerosis Gift Ideas for a walk or fund-raiser. 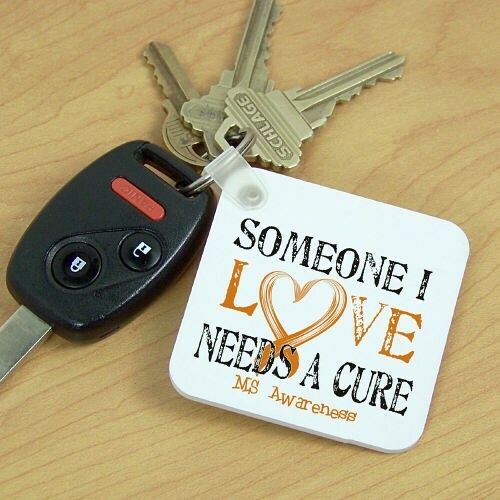 Our Multiple Sclerosis Awareness Key Chain is perfect for spreading awareness. This Awareness Key Chain measures 2 1/4" x 2 1/4" and is 1/8" thick. Your Key Chain is made of fiber glass reinforced plastic and includes a key ring. MS has been apart of my life for 10 years. My godmother whom I adore & am close to was diagnosed with this crippling disease at the tender age of 29, by 32 she was bed ridden and is now 39. I've been watching my Godmother decay in her own bedroom for so long and its heart breaking. This product, this website, & everyone that gets involved gives me hope that there going to one day find a cure for others in hopefully the near future. Thank you so much. My family members loved it. My mom loves it! It is nice to have an awareness for MS! Love the message but would love to see this in metal rather than plastic. One, because I think it looks nicer and two, so it can be recycled when the printing wears off rather than just bring thrown away. Additional Info Multiple Sclerosis is a chronic, often disabling disease that attacks the central nervous system, which is made up of the brain, spinal cord and optic nerves. The progress, severity and specific symptoms of MS are unpredictable and vary from one person to another. Join us in raising awareness today with Multiple Sclerosis Awareness Gifts from MyWalkGear.com. Here you can support the ones you love who suffer everyday with this debilitating disease and give them hope that one day we will find a cure. Also, view our Personalized Needs a Cure MS T-Shirt and Personalized Needs a Cure Sports Water Bottle for any upcoming event you're participating in.